Wellington School’s Indoor and Outdoor Nursery provides a stimulating and dynamic environment where emphasis is placed on the individual. Welcoming boys and girls from the age of three, Wellington Nursery offers specialist teaching in a number of subjects and the highly experienced staff ensure that children progress to the next stage of their development as happy, curious, fulfilled and confident learners. The nursery is run in partnership with South Ayrshire Council and in November 2016, received an unannounced inspection from the Care Inspectorate (the body responsible for the regulation and inspection of care services in Scotland). The Nursery offers both an indoor and outdoor facility, funded places, healthy snacks, swimming lessons, daily outdoor education, the benefits of an all through school (teaching, facilities, mentorship etc) and care until 5.30pm. It is little wonder that as a result of this inspection, the ‘quality of the care and support’ at Wellington was graded as ‘6- Excellent’. Inspectors examined various aspects of the nurseries but most importantly, the experience for children. The highly experienced staff were found to be ‘skilled, kind, caring and patient’ meanwhile, a ‘particular strength’ is the planning of ‘consistent routines and a rich programme of activities based on children’s own ideas and interests’. As a result, ‘children were fully engaged in leading their own learning. Through activities, including healthy snack preparation, fire safety, swimming, outdoor play, art and recycling, children were developing confidence, independence skills and were progressing well in all aspects of their learning. 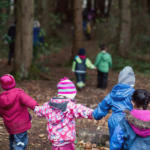 Staff supported children to explore the indoor and outdoor environments to design activities, assess risk, choose to play with friends or on their own and investigate the natural world’. environment and to be aware of the needs of others within a stimulating, supportive, secure and well-resourced learning environment. It is perhaps for this reason that parents spoke so highly of the nursery; in confidential discussions with the Care Inspectorate, they expressed their trust in the staff and felt that the children had outstanding learning experiences. One parent remarked that ‘my child has progressed greatly which I believe is down to the great staff throughout the nursery and their fantastic learning and development programmes’. Another praised how the Nursery includes parents in their child’s education: ‘we have opportunities to spend time in the nursery at the stay and play sessions, trips and some parents can volunteer their skills’. Others highlighted swimming lessons and the Outdoor Nursery – both of which are entirely unique to Wellington. nursery and [were] presented as enthusiastic learners’. The report of their findings was published on the Care Inspectorate website on the 16th of January, 2017. Please click on the button below.